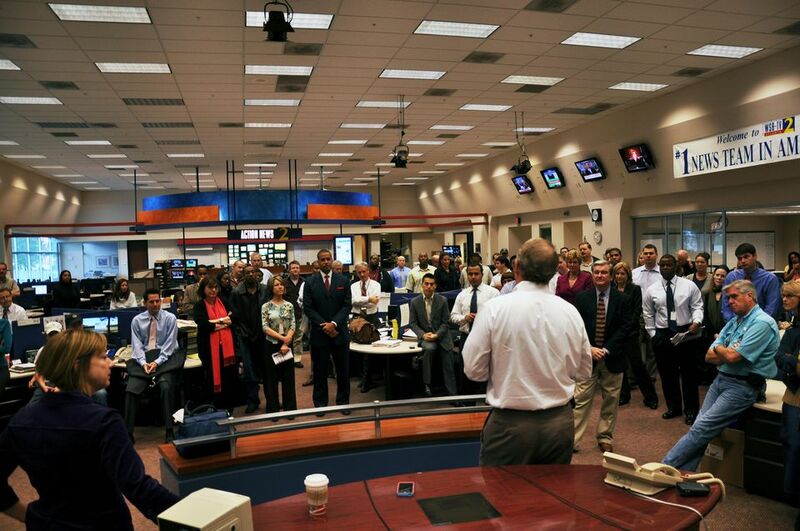 You become a journalist because you want to be where the action is. You become a TV reporter because it pays decent and most folks depend on TV for news. You go to a prestigious college for an undergrad degree, then an even more prestigious college for a Masters in Journalism. You slog through small markets in West Virginia and northern California. Then you hit it big, with a contract in Atlanta at a top-ten market station. Your name is Justin Gray. You’re a reporter at WAGA. Tuesday morning, you found yourself on an overnight shift at Neels Gap near Blairsville, doing stories about snowfall in north Georgia. Your education at Emory and Columbia make you vastly overqualified to produce a report that weaves through the supposed perils of snow and ice, only to conclude “the roads are looking pretty good up here in North Georgia.” The conclusion validates your own honesty and tacitly exposes the foolhardiness of the managerial mindset of local TV news. You aren’t alone. Your competitor, the wily veteran Ross Cavitt at WSB, did something comparable the previous night in Ellijay. One of the best reporters in Atlanta, Cavitt was reduced to questioning motorists in a parking lot and asking them if they were surprised by a half-inch of snow. Because Cavitt made a decent package out of it Monday, his managers at WSB will ask him to do it again when another snow flurry rears its flaky head. These by-the-book approaches to weather drive TV reporters nutso, and drive viewers with a fragment of intelligence away from local TV news. Research measures “households using television,” and that number jumps when weather gets squirrelly. But it’s not because viewers want to see Cavitt and Gray tap-dancing in the snow; it’s because they want to know the forecast. Interestingly, WXIA approached the snow flurry story differently. 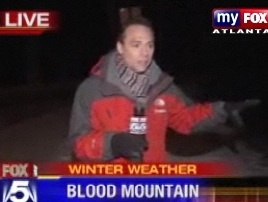 WXIA sent its web guy, Chris Sweigart to Blue Ridge — possibly with no photog, but with a camcorder. Sweigart recorded some video in various locales, and voiced over the scenes matter-of-factly, without the “omigod, it could be armageddon” urgency of a story on the effects / surprise of a November snow flurry. “What I’m doing right now — enjoying the silence. There’s always a beautiful silence when snow is falling,” Sweigart prosaically concluded, capturing the essence of the “story.” For some local news directors who demand more sturm und drang with their weather coverage, Sweigart’s prose would be borderline subversive. This entry was posted in WAGA, WSB, WXIA on December 2, 2008 by live apt fire. It snows in north Georgia because it’s north Georgia. Good God, I seriously think if there was less hype over even the remote possibility of snow that there’d be far less of our stereotypical stupidity about the white stuff here in Atlanta. Don’t start freaking until the power’s out, all roads are impassible and there are lake-effect snows blocking the streets in McDunna. Spelling in last word of that final sentence intentional.